The Ex Pukebox has grown over the last few years from several late night conversations about horrible songs that we've been forced to listen to for most of our life. Not just bad songs or crap songs but the big hits they never stop playing. These songs are either vomitable (Terrie's word) or massively irritating. Christmas songs that come back every year and seem to get worse each year. And the songs you hear streaming out of high streets shops, halls of residence bars, jukeboxes in bars pubs cafes and of course daytime radio. We chose “Do They Know It's Christmas” as our number one for its exaggerated heartstring pulling over the top performances by all the singers and the stomach churningly, patronising lyrics (see below) or “Uptown Girl” and “My Sharona”, songs with vile catchy choruses (as the Dutch call them “earworms”). Tunes you can't get out of your head, no matter how horrible they are. You might have noticed that many songs are from the late 70s to mid 80s. These songs really stood the test of time. They were vomitable when they first came out and continue to this day to make us feel nauseous inside. There are enough top 50s out there. 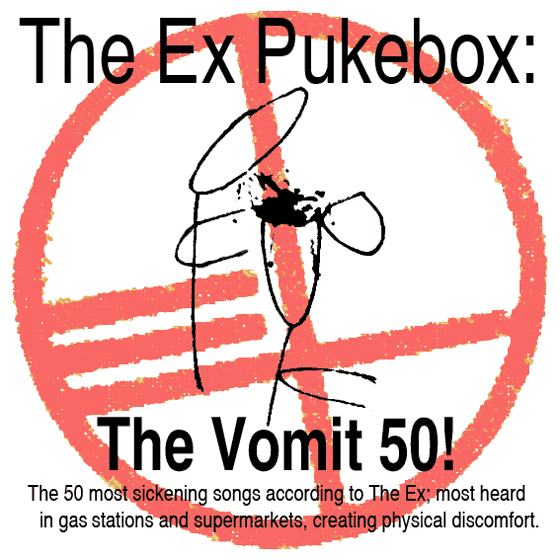 Here is our Vomit 50, The Ex Pukebox. Feel free to post yours on our facebook page.